A blog with a critical and humorous look at important philosophical and psychological issues, sometimes bordering on the absurd and insane. It is also a blog for writers, where some of my short stories are showcased and some tips for improving writing and accepting criticism are given. 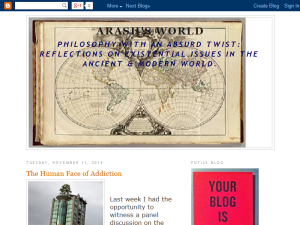 This what your Arash's World Blog Ad will look like to visitors! Of course you will want to use keywords and ad targeting to get the most out of your ad campaign! So purchase an ad space today before there all gone! God as a Narcissistic Artist: A Review of Aronofsky’s mother! If you are the owner of Arash's World, or someone who enjoys this blog why not upgrade it to a Featured Listing or Permanent Listing?